“My Stuff: Lou Doillon,” Vanity Fair, August 2013. Going through old magazines I came across the feature “My Things” with Lou Doillon in a Vanity Fair from August 2013. Lou is the daughter of actress Jane Birkin and she certainly has that Jane Birkin/1970s/Bohemian look down pat, right? I love her sooty eyes, heavy bangs, dark nails and leopard jacket in this photo. I also really like the length of the jacket she is wearing. It seems lightweight and perfect for fall when temperatures are starting to cool. The moody-looking Lou. Love this photo of her! I must’ve been influenced by Lou in her leopard because I could not resist picking up this jacket by Laundry by Shelli Segal during the Nordstrom Anniversary Sale, which I normally have no problem resisting. I like the fabric and the trim but I think this has to go back because it is much heavier than the lightweight long jacket I had in mind—to be fair it is called the “Ribbon Trim Tweed Coat” but I was hoping it would be a super thin one!—and it is also much more formal looking than the jacket I had in mind. 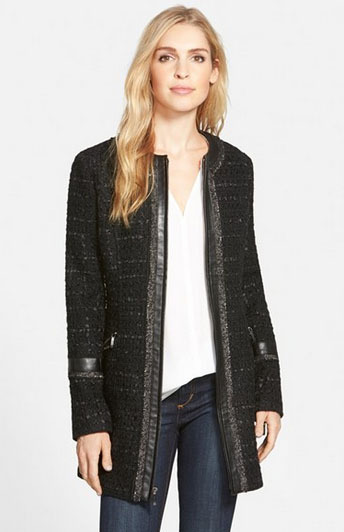 Ribbon Trim Tweed Coat from Laundry by Shelli Segal. I like the fabric and detailing. I do like this length of a jacket, especially since it seems most fall jackets hit at the hip or just below, so my search continues. Let me know what you think of Lou’s look or longer jackets for fall. If you have any shopping or brand recommendations, please pass them along! The Long Jacket is a very good look The Den highly recommends for Fall but ladies please, no more Uggs! Jill, I like your description of Lou. I love that length of jacket. I have several. I find it very flattering as it covers bums, hips etc. I'm on the hunt for longer jackets now that they seem to be coming back "in." My requirements are some softness, a v-neck silhouette, and a bit of shaping so they're not too boxy. So far this has been like chasing unicorns! Would wear LD's leopard print in a heartbeat! If James Perse puts out this jacket in another color, I will buy it sale or no sale. I had a much beloved burgundy velvet Edwardian style fitted jacket in the 70's & into the 80's that was my go-to jacket. My husband even remembers it. I guess longer fitted jackets are best for me. Boxy would not be as flattering. I love longer jackets and I have been searching for a leopard one just like this for a long time. I actually have a personal shopper for a top notch consignment shop keeping her eyes open for me...just for this one garment. I sent her a picture two weeks ago. The issue has been finding one in a Misses 16. The tweed jacket is gorgeous as well. I pinned it to one of my boards. I love Lou's leopard coat and the one you're returning to Nordstrom. Last year, I bought a long black blazer from Madewell in the length you seek. It's such an outfit maker. For the lighter weight you're looking for, possibly try a sweater coat. Although it's a different look and feel than the leopard coat. I will be on the lookout for you. Hi Helen, thanks for reminding me about Madewell, I will have a look at their website! I have been eyeing some sweater jackets but the ones I've seen offer no pocket option and I need a place for phone and keys when I take my daughter to school! Love the look of the leopard coat. I have a light topper that's very similar and need to break it out when it's cooler.